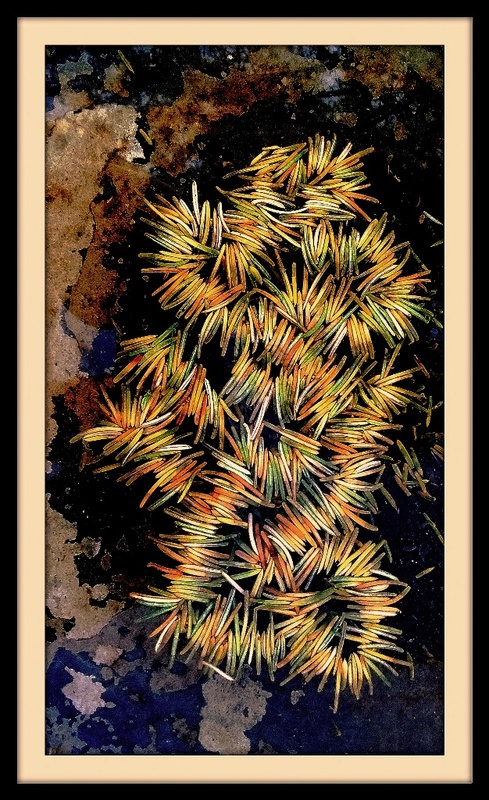 When an old spruce tree in the front yard was dying, it dropped needles in my birdbath. I saw this pattern against the bottom of the birdbath and thought it was a pretty artsy natural piece of art that I had to capture. Previously posted Owl/Woodpecker image is from the trunk of the same tree after its' demise. Motorola Moto E phone, 2.47mm, f2.2@1/40 sec., processed in Picasa. A great-looking pattern, Joe. That tree was very special, and you are very talented to carve it so nicely. Well done. Very pretty indeed. Very nice how they are arranged so symmetrically to create a pleasing design. Sort of caterpillar-like, the way they swirl around. Did you alter the colors? They are lovely. Not so fond of the framing- just my personal preference. They did vary quite a bit in color. Thank you both for your comments and input. Much better, Joe-I agree. The mat color in the frame is much nicer too. I personally prefer the original. The color is what makes it come to life for me. I like the original best, the colours are just right for my tastes and I like the swirling curves. Reminds me of the thick strands of tinsel that get hung around at Christmas - maybe this is nature's version. Thanks, all, for your comments and input.